Welcome to The Speckled Door. A little bit about a lot. For me, The Speckled Door is somewhat of a personal time capsule for everything I love and have put time and research effort into. 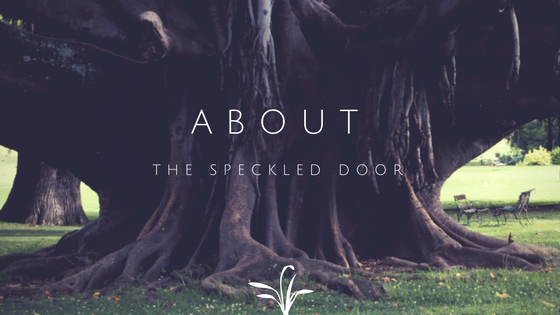 For you, The Speckled Door may be a useful reference tool or maybe just an entertaining read now and then. My husband and I live in an old Victorian home. We know the home is over 100 years old but haven’t done the research yet to get an exact number yet. We really need to do that one of these days. Anyway, living in such an old home means lots of updates and repairs are always in the works and on the horizon. The maintenance aspect seems to deter a lot of people from buying older homes but I really love it. It’s a life long project that will never end but every year we complete a handful of tasks and our home is that much more a part of us. Even if we lived in a brand new home there’d always be things we’d want to change to our liking and update so it just makes more sense to me to start with a home that already has so much of the history and character that I love, and then just continue to add to it. Projects like built-in bookcases, crown moulding, replacing panes and sash cords and reglazing windows, minor electrical and plumbing fixes, retiling bathrooms, hanging heavy objects on plaster walls, changing out hardware and fixtures on everything you can imagine, and so. much. painting. And that’s just the interior! On the outside, we’re still trying to figure out what plants can survive with the light, moisture, dog and chicken constraints we have in our backyard. We’ve built a pergola, a stone walkway, a greenhouse out of reclaimed windows, a chicken coop, and painted the entire exterior of the house ourselves. Kind of overwhelming when I think about it all at once and then think about how much more we still want to do with the house but this has been over the course of about 8 years. We’re definitely not fast DIYers by any means. Basically, however long we initially think a project will take, we quadruple that when planning and that’s usually closer to our reality. We live with one cat, two Great Danes and three chickens. Well, the chickens live in their coop and in the backyard but their coop is pretty swanky and they’re spoiled rotten just like the indoor animals are so I still pretty much think of them as pets. Our cat just turned 14 and while he tolerates the dogs, they’re definitely not bffs so I’m always trying to think of toys and projects that will keep the two species separate but entertained individually. Our Danes are 8 and 3 years old. The older one just had surgery on her spine in April to remove part of a slipped disk that was likely brought on in part by undiagnosed Wobbler’s. She’s doing great now but the whole experience forced us to learn so much in a short amount of time so there will definitely several posts about the details and on how we helped her recover from the surgery. Having two giant dogs creates very different obstacles than having medium to small breed dogs does. Like having your dog sleep in bed with you? Not when each one is the size of another person you don’t. Want to go on a trip with your dogs? Better plan on taking two cars when one dog takes up the entire back seat while the other takes up the entire trunk area themselves. We love them to death and will likely always have two for the rest of our lives but there is a lot we’ve learned over the years on how to adjust and plan for activities with them accordingly. We’re going into the second winter with the chickens and I absolutely love having them. There has been quite the learning curve to get here but there’s nothing like looking in your fridge and seeing a dozen beautifully colored eggs laid by the hens you’ve raised. It’s probably all in our heads but we’re convinced their eggs taste better than even the most expensive, vegetarian, cage free, organic, this that and the other egg you can find in the store. I’m completely addicted to sugar and pastries in general so I’ll use any excuse I can find to bake cakes for friends and family. It’s your birthday? Let me make you a cake. Holiday coming up? How about I bring a cake. Just bought a great pair of sneakers? I think that deserves a cake. I just love the whole process and especially the big reveal of presenting the cake and slicing into it. I find it all so rewarding and comforting so you can bet there will be plenty of posts on cakes and other baked goods. In my world, a doughnut or danish fixes just about anything. I’m a bit of a horror movie addict. It’s gotten to the point where I’ve seen everything with high ratings on Hulu, Netflix and Amazon so now, even something with two stars is fair game for viewing. I’ll definitely be posting some thoughts and reviews on my favs. Same thing goes for games, be it video, board, card, etc. A few years ago we started going to a friend’s weekly game night and learned about deck building games. Now we host our own game nights, have gone through many other types of games and have just started learning our first RPG game so lots to post about on that topic as well. I am in no way a professional blogger. Maybe one day, years down the road, but right now I’m lucky if I remember to take pictures at all, let alone take good ones. Rest assured, I’m working on it and hopefully with every new project and post, I’ll get a little better at providing you with better pictures and guides.